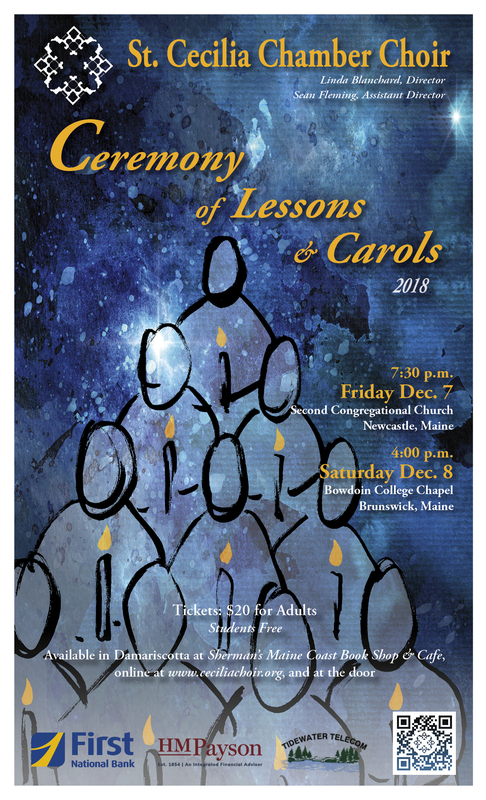 Notes: St. Cecilia Chamber Choir will present its annual Lessons and Carols Christmas concerts on Dec. 7 at 7:30 p.m., at the Second Congregational Church in Newcastle, and Saturday, Dec. 8 at 4 p.m. at the Bowdoin College Chapel. Linda Blanchard is St. Cecilia’s artistic director and conductor, assisted by organist and pianist Sean Fleming . Advance tickets or reservations are strongly encouraged for this popular event. A sublime setting of the ancient text “Gloria in Excelsis Deo” by the Renaissance composer Thomas Weelkes will be featured, as well as a beautiful setting of Ave Maria by the Spanish composer Javier Busto. Javier Busto is in demand throughout the world as a conductor and composer. St. Cecilia will also perform “Drop Down Ye Heavens” by Judith Weir, “People Look East” by Maine composer Richard Francis, “There is No Rose” and the King’s College favorite “Alleluya, a New Work is Come On Hand” by Peter Wishart, “A Spotless Rose” by Herbert Howells, the rousing “I Saw Three Ships” by Simon Preston, “Sussex Carol” arranged by Philip Ledger, and a new arrangement of “Wexford Carol” first performed by the Mormon Tabernacle Choir in 2015. A professional string quartet will accompany the group on selected pieces. As a special treat, Eric Whitacre’s “Glow,” written for the “World of Color – Winter Dreams” show which premiered at Disney California Adventure Park in California, will be performed. 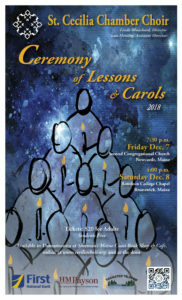 With audience sing-along caroling as well, this concert is sure to be a treat for the whole family. For more than 20 years, St. Cecilia Chamber Choir has been providing challenging musical opportunities and music scholarships for gifted local youth. Since the Choir’s inception, over 25 gifted young students have sung with us, many continuing to study and perform music in college and beyond. Advance tickets or reservations are strongly encouraged for this popular event. Tickets are $20 for adults, free for students. Purchase them soon at Sherman’s Maine Coast Book Shop & Cafe (Main Street), Damariscotta or online at www.ceciliachoir.org. For more information, visit the St. Cecilia website or call 207-380-2768.